Brooke and Tim are high school sweethearts who grew up in Southeastern Virginia. Even though they were only 16 when they started dating, they knew immediately that they had found the one God was calling them to marry. They went to different DC-area universities, and after almost six years of dating Tim proposed just two months before their undergraduate graduation. It was Good Friday when Tim dropped to one knee, and Brooke happily said “yes” to spending the rest of her life imaging Christ’s loving sacrifice on the cross in her future marriage to Tim. 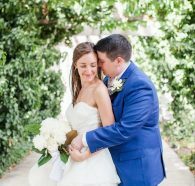 They were married on June 30, 2017 on the campus of Brooke’s alma mater, Catholic University, with a wedding liturgy and celebration together with 125 of their beloved family and friends.